As a Google Premier Partner specializing in AdWords, Google has authorized us to provide you with a $100 Google AdWords voucher for you to experience the benefits of advertising your business through Google AdWords. Simply fill out the form below and we will send you an AdWords voucher code good for $100 in AdWords credit. Please send information about your AdWords management services with the AdWords voucher. Just send the AdWords voucher please, I will manage the account myself. AdWords voucher codes can only be used for your new AdWords clients within the first 14 days of the account being opened. 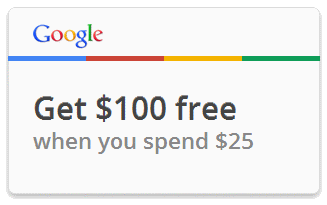 AdWords voucher codes can only be used for new Google AdWords accounts with billing addresses in the US. Only one AdWords voucher can be used per client. Still have questions? Give us a call! You can reach us at 1-425-405-0690 from Monday-Friday, 9am-6pm PST.